Jamie Roberts will put his friendship with British and Irish Lions centre partner Brian O'Driscoll aside for the "biggest game" of his rugby career. The pair combined superbly on the 2009 tour to South Africa, with Roberts winning the man-of-the-series award. Now Roberts' midfield battle with the Irish captain is an intriguing subplot in Saturday's World Cup quarter-final between Wales and Ireland. "Certainly coming up against Brian is a great test," said Roberts. "We are great friends and hopefully it will a great battle come Saturday. "It is always good to play with those guys off that [Lions] tour as I'm sure the Irish boys will agree it was a memorable tour. "Brian has shown great longevity in his career and he is playing at a standard which he set when he won his first cap. "He is a very tough opponent and all the Irish boys are. "There are some very experienced players in their ranks and it will be a very tough day for us on Saturday." Roberts, who is expected to win his 36th Wales cap against Ireland in Wellington, will hope to guide a youthful Welsh backline into their first World Cup semi-final since the inaugural competition in 1987. O'Driscoll, on the other hand, will be in charge of a vastly experienced back division as he aims to manoeuvre Ireland's golden generation into his nation's first World Cup semi-final. But the 32-year-old three-times Six Nations player of the tournament says he will not underestimate his own midfield challenge with his young Welsh rival. 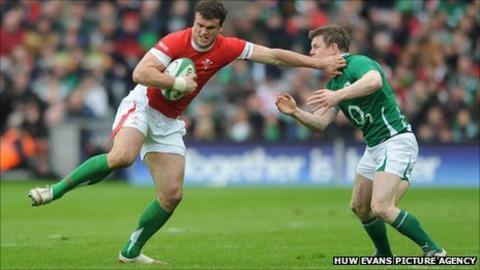 "Jamie is going well and he'll be a handful," said O'Driscoll, who will be winning his 117th cap. "Jamie carries extremely hard but has developed his game well and brought in some really nice subtlety to it as well. "He has some good skills and is not afraid of mixing that up and that makes him very difficult to read and that is where he has evolved as a player. "What hasn't changed is his ability to carry the ball in contact and make gain lines and and teams play off go-forward ball and he is one of their go-to guys for that. "But there will be a great competition between myself and Darce [Gordon D'Arcy] and their centre pairing irrespective of who they pick because they have got three guys in good form." For the latest on the 2011 Rugby World Cup in New Zealand visit our breaking news and gossip page.